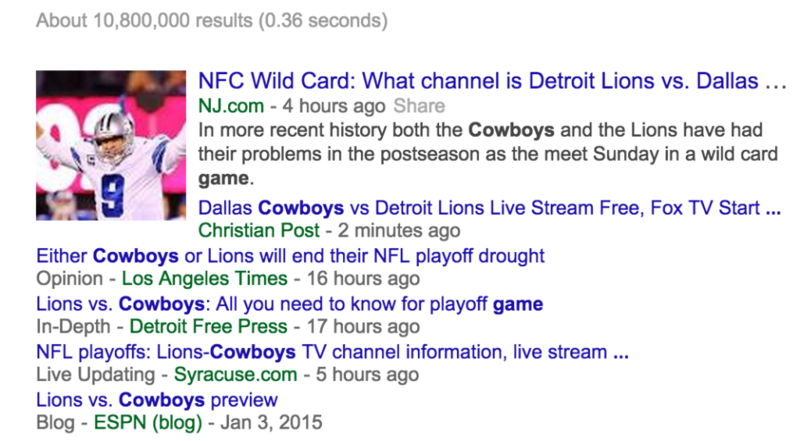 This morning I wanted to know whether the spousal unit and I had time to whip up a batch of Chex mix before the Dallas Cowboys-Detroit Lions game, so I Googled the term “Cowboys game.” Shockingly I found no local-news sources on the first page of results, general or news, logged in or out. What the heck, I wondered? My alma mater is chock full of Dallas Cowboys coverage, some of it expert-level analysis as good as any you’ll find on the Internet. Why did none of it appear for me in search? First, let me say that this page is gorgeous. The design team at the News is doing a heck of a job with these special pages. They’re truly a breath of fresh air. Ah, now we’re getting somewhere. Google, creepily prescient as always, somehow knew that I was looking for Who-What-When-Where type of information, so it returned hits that satisfy that need. The headlines above have something else in common: They aren’t ambiguous. Google rewards specificity. In this example, it’s not enough to have “Cowboys” in a title tag and “Detroit” in the H1. All of the top-results headlines contain both “Cowboys” and “Lions.” I’d love to see if changing the title tag on the News’ story would bump it up in the SERPs. Canonical URL: This tells the search engine “This URL is the definitive source for the content it holds.” Standard SEO stuff. Right. So, the good news is “Dallas Cowboys” and “Detroit Lions” made the cut. The bad news? So did 18 other terms. Google’s limit for this tag is 10. Image alt tags: Some experts will say this is too nitty-gritty to worry about. I say why not use every tool at your disposal? The takeaway: You can have the most beautiful page in the world, but if you whiff on the details, you’ll lose on game day. Good analysis! Sometimes you have to wonder if these big media companies think that they can just coast on the fact that people will link to them and search engines rank them just because their a big media outlet. Truth be told, even if they had a hideous looking page and terrible SEO – they’d still get a bunch of links from users. I’m awaiting the day, where companies start asking viewers and consumers to link to them on their blog. I don’t think it’s a far stretch, since they’re already asking for tweets and likes in commercials.